Chinese becomes increasingly important | Wha’ever! Today I came across this article on The Next Web . 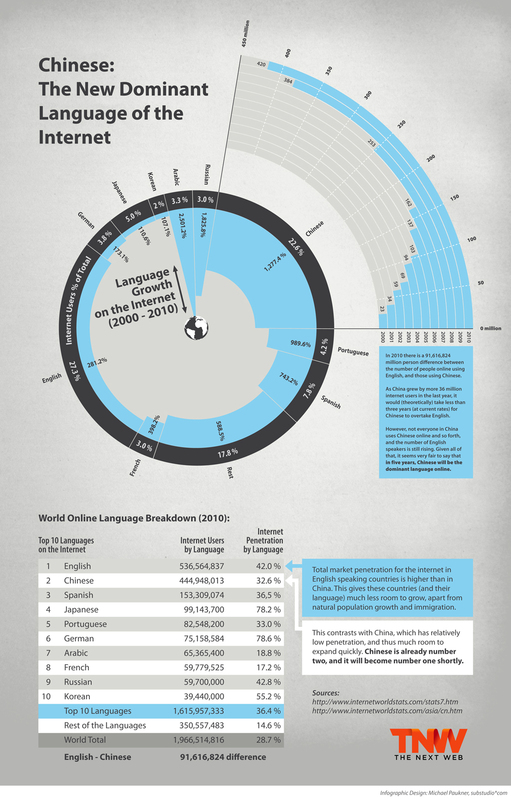 Chinese is the new dominant language on the internet – with less than 100 million users distance to English! Following the rapidly increasing importance of China as second trading partner to Europe after the U.S. one wonders if we should not also learn Chinese, preferably at the same level as English? More and more people indeed take up the challenge already if one can trust this article on the American-Chinese Forum , and there is little doubt that for the younger generations and definitely the ones to come, Chinese language skills will be crucial if they would like to develop their careers. Already now people with knowledge of Chinese language and not less importantly Chinese culture are sought after. I dare to suggest that at the very latest in 3 years Chinese will be offered at ground schools in Europe as a language option. Maybe even sooner, depending on how rapidly Chinese business in Europe and the Western world keeps growing, and more importantly, how soon we will react to this and actively meet this development by catering for these needs. Given the fact that China replaced the US as India’s biggest trade partner, Chinese will be offered in Indian schools as early as from March 2011. There are interesting times ahead indeed, and I do mean this in a positive way, not in terms of the meaning of the old proverb “May you live in interesting times”, which many people think is a Chinese curse. There the learning curve starts already, the proverb might firstly not be Chinese at all and secondly, even if Chinese, misinterpreted and mistranslated. That much for a taste of the challenge we Westerners are up for 😉 . If one looks at the time of colonialism and Westerners trying to force their language and culture onto China, then it seems only like a more than fair development in world history that the country gains more influence now. Important to know is that China never got conquered by any other nation, and that they have been ahead of all of us since way back before Christ. Take a look at the list of their inventions, paper making, printing and gunpowder being just a few of them. What would we be without these? Not to mention the Chinese martial arts we are fascinated by, and their philosophers like Confucius and Sun Tsu, their famous military general; we learnt from them all. In terms of colonialism, only the bare rock of Hong-Kong was left to Britain, and that only for 156 years before it fell back to China in 1997, probably allowing them getting a valuable update on how the Western trade and business world functions. These are just some thoughts I put together, simply because I feel that Chinese influence in Europe is more noticeable than ever nowadays. I do not intend to get lost in the hundreds of thousands pros and cons of the fact that China gains more and more influence worldwide, among other reasons because one could probably raise most of the same pros and cons for any other influential nation. Neither I would call myself an expert in all these matters. Only, when reading the TNW article followed by more browsing and reading, I realised that there is a huge amount left to learn for us, and that it is learning time now it seems. We really should make an effort since it will be important for our future. Personally I find it really fascinating to follow this development. When I was little, China was a far away country, what we call a developing country in fact, and not almost every toy you held in your hands came from China. If any of them came from that region of the world, then it was usually from Hong-Kong or Taiwan. Certainly nobody back then even dreamt of taking classes in Chinese or even traveling there. Unless you were one of those weirdos that did not fit into society anyway… Nowadays, traveling to China is a vital, regular part of international business in a lot of industries, and learning Chinese seems bound to be one of the best investments ever into your own future. Who would have thought that only twenty years ago? This entry was posted in Current Affairs, Life and tagged china by anmara. Bookmark the permalink.